Geoffrey Chaucer, known as the father of English Literature, was credited with the quote, “All good things must come to an end”, back.in the year 1374. I don’t want to believe that, but this particular “holiday” is coming to its end. Alison and I woke up just after 4am (11pm eastern) to say goodbye to Marion and Barry as their driver picked them up at 5:15 for the trip to Heathrow. Our flight wasn’t until 12:15, with our pickup scheduled for 8:30. We had a quiet breakfast, showered and dressed, finished packing and straightening up the flat, one last time. We saw the driver, David, down in the street, a bit on the early side, so we hefted the bags down the stairs and into the cool morning air for a quick roll across the street and into the Mercedes van. David led a lively conversation around local economics, which spread to the US and our government shutdown and Obama Care. The UK has done well the last year or two. Most Londoners left town during the Olympics, which he said actually made things less hectic for him. The owners of our flat, bought the building a couple years ago, literally gutted, and refinished the retail space on the street level, and at least 3 flats above. The current value of our flat alone is estimated at 1.2 million pounds, or about $1.95 million. Location, location, location. The flat was nice, but I wouldn’t pay that much for it. The traffic to Heathrow was light, and we arrived in great time – not that we needed to. The USAirways ticket counter was easy to find, and we checked our bags with little fanfare. Security wasn’t bad, either, and we were through security with 2-1/2 hours to spare. Hey, why not shop?! So, we wondered the shops for a bit, including an airport version of Harrods, which surprised me. We made it to the Star Alliance Lounge for coffee, a banana, toast, bacon, and newspapers – and internet access, to occupy the time. We boarded the Airbus 330, the same configuration we flew to Stockholm 3 weeks earlier, and moved in to our cubicles – 1C and 1F, right next to each other in the center of the plane. We got some orange juice to continue battling our colds, or whatever, and read until we got our meal. Unlike the trip over, we decided to take advantage of the movies this time. I watched Star Trek into Darkness, The Great Gatsby, and rounded it out with The Internship, a comedy about older Google interns, Vince Vaughn and Owen Wilson. We touched down at 2:55pm. Immigration was fine, it took forever to retrieve our “priority” baggage, but I’m always thankful when they arrive on the belt, and we stood in long lines that moved at Customs. All we wanted to do was to get down to street level on the elevator, but too many hands pushing unintended buttons, and we ended up traveling all the way to rooftop parking before working our way back down to street level. LOL – several of us were lightly threatening anyone to put their fingers anywhere near the elevator buttons! Alison and Meghan coordinated timing from the Cell Lot, and it worked out perfectly, and we threw our 100+ pounds of total luggage into the back of the Pilot. The drive home was uneventful, and we got home around 4:30. Lauren chipped in and picked up Zach from daycare and got home shortly after us. Zach gives such good hugs and kisses! Alison presented her gifts, we had tea, and later, said good night to Meghan and Zach. After sorting a few dirty clothes, the mail, paying a bill or two, calling Mom to tell her we were home, and doing little else – we were shot, and went to bed around 8 – basically a 21 hour day. And, as mentioned above, all good things must come to an end. We intentionally left our last full day in London unplanned, which was actually a potentially dangerous decision on our part. Why? The ladies decided that we should pop over to Harrods Department Store, known as one of the most luxurious department stores in the world. It’s amazing! To get there involved a sophisticated Tube Switch maneuver. The ladies spent several minutes back in the flat reviewing their Tube maps to determine the best routes. We walked to the Oxford Circus entrance, Barry and I “topped off” our Oyster Cards, and we were ready to go. Started on the Victoria Line down to Green Park; changed to the Picdadilly Line and went two stops to KnightsBridge, popped up to the surface, turned left and found Harrods. Whew! Piece of cake. 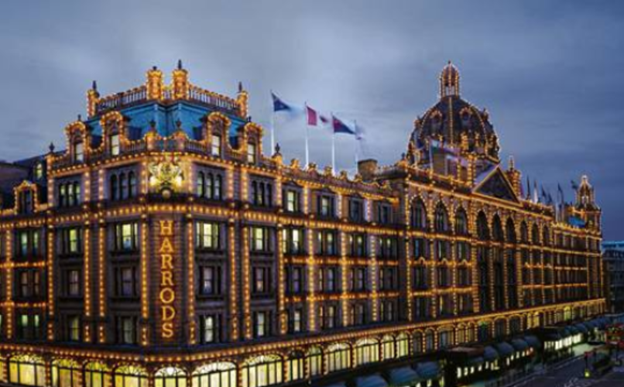 Our primary objective was the famed/”awesome” Harrods Food Court. A simple Wow is justified here, and we spent most of our alloted time in this area. We individually spent time wandering the store, which was an experience in itself. There were almost as many sales floor people as there were customers! Barry came across, but didn’t buy, an 80″ ultra-high definition TV for a mere $35,000. The return trip via the tube was almost second nature. We made two stops once we popped to the surface at Oxford Circus. The first was to experience Fish & Chips, so we stopped at Garfunkels, which we had targeted earlier in the stay. The deep-fried haddock and chips (french fries) also came with roasted lemon, tartar sauce and “mushy peas”. And, we all sampled another local beer. The fish – eh. The chips – OK – applied some vinegar to them, in addition to catsup. Mushy peas – not bad, actually. Each couple shared a “sticky toffee pudding” serving for desert – not bad. 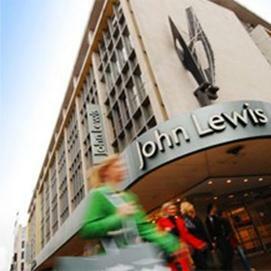 The last stop was John Lewis on Oxford Street – for which we partook of their reputable food court (super market) multiple times throughout our visit for wine, cheese, prepared dinners, fruits and vegetables. We were so full from our Garfunkel’s visit that we decided to eat in for our last dinner. Very good food. While heating the dinner, Marion and I dumped and shared pictures – almost 4,500 of them – from cameras and smart phones. The ladies also confirmed our pickup times with the driver, and checked in with the airlines. The wireless router in the flat got a LOT of activity during our stay, and performed like a champ. We had two laptops, 3 iPads, one Kindle, and 4 smart phones. Are we hip or what? We all started packing, too. As things quieted down after Alison and Barry headed for bed, Marion donated a reasonable amount of her time bringing me up-to-speed, sort of, with The Master Genealogist program. Ugh. There is so much work to do!